Bill Cleyndert and Leigh Powley in their 1928 Ford Model A held on to win a tense battle against Paul Crosby and Ali Procter’s MG TB Supercharged to win their first ever Flying Scotsman. Having taken the lead on Saturday when Crosby’s MG suffered clutch selection problems, the two cars took to the fray on Sunday with just 23 seconds separating the pair. Crosby and Procter had said they were going to push hard. 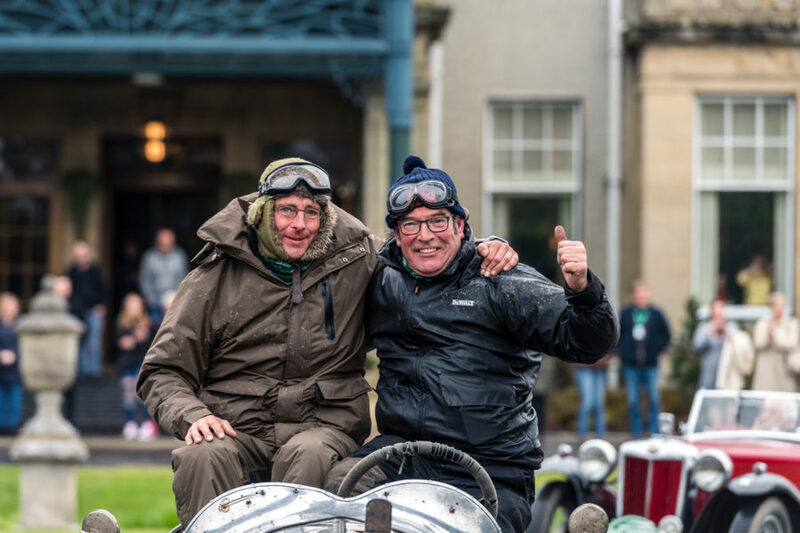 With four tough tests and exacting regularities to go on the route from Turnberry to Gleneagles the leading nervous crews headed out to do battle, others just to enjoy the great rally and achieve a finish. But there was to be another twist, Bill Cleyndert has said at the lunch halt that he was a bit worried by a half shaft noise on the Ford but dismissed it as hearing noises that aren’t there when you are in a nail-biting finish. But the shaft did work loose, and Bill had to tighten it, losing 50 seconds to Crosby and Procter over the last two tests. Paul, “We needed one more test and we would have got them, but I am happy for Bill and Leigh and very happy with second!” Just 11 seconds separated the battling pair at the end of three days and 700 miles of competition. “That was such an exciting finish, we did it just by the skin of our teeth,” added Cleyndert. Navigator Leigh Powley never made a mistake on the tough event, his navigation skills and calmness under pressure made the difference. Whilst the top crews battled for honours many battled just to finish, some didn’t even manage that but were determined to get to the finish and see their friends go under the ERA Flying Scotsman finish arch at Gleneagles. The Scottish weather proved to be a bit cloudy and dull with some rain, which the Scots call ‘dreich’ but that didn’t deter the crews from enjoying the final day of motor sport on the Flying Scotsman. Teams headed straight from their Turnberry hotel to the airfield close by for a test. The 1948 HRG 1500 of Keith Ashworth and David Roberts was sliding around over the mixed surface of concrete, dust and stones but got a puncture. Keith and David limped to the finish and started the long process of changing the wheel starting with the two strapped to the back of the little car. They were back on the move ten minutes later, eventually finishing the event 24th. Car four, Belgians Lieven van Hoylandt and Wim de Sutter appeared at the finish line with a marker cone under the front of their 1922 Bentley whilst James Tibbetts and Kevin Dodman’s Talbot 105 Brooklands sounded and looked just like it’s racing brother from banking of the famous old track in Surrey. The Belgians finished 34th whilst the Talbot was 32nd and 4th in class, just off of the podium steps.